The Air Force offers two enlistment options for new recruits. The first one is "guaranteed job," where the applicant has a specific job guaranteed in their enlistment contract. 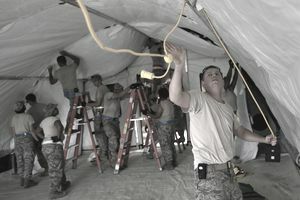 The second option is the "guaranteed aptitude area," where applicants are guaranteed to receive a job in a specific aptitude area, but won't actually find out what the job is until they are in basic training. Below are the Air Force enlisted jobs which fall into the "General" aptitude area. Click on the link for complete job description and other qualification criteria. Information in the parenthesis indicates the score required in the "General" Category of the Air Force ASVAB Composite Scores. Note: AFSCs (Jobs) with more than one score area listed, require a qualifying score in both areas. For example, in order to qualify for AFSC 5R0X1, Chaplain Service Support, one would need to score at least 43 in the "General" area of the Air Force ASVAB Composite Scores, and at least a 40 in the "Administrative" area of the Air Force ASVAB Composite Scores. * Indicates that the AFSC (Job) is a special duty assignment or other AFSC which is not available to initial recruits.